(From Left to Right) Hudson County Freeholder E. Junior Maldonado, Lou Mont, COO of Manhattan Building Company, Jersey City Mayor Steven Fulop and Jersey City Councilwoman Joyce Watterman cut a ceremonial ribbon to officially open Cast Iron Lofts II, an upscale collection of 232 apartment homes in the Cast Iron Collection on the border of Jersey City and Hoboken. 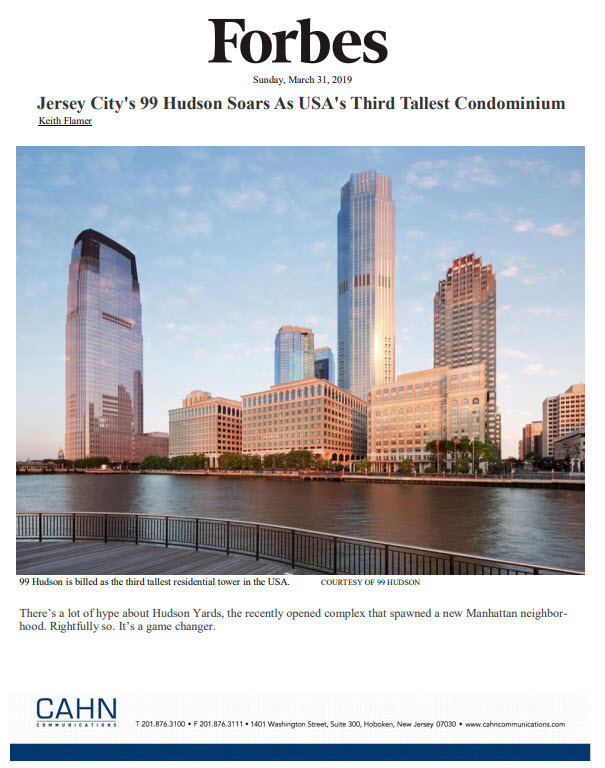 JERSEY CITY, NJ – Jersey City Mayor Steven Fulop joined officials from Manhattan Building Company on Wednesday, May 25th to officially open Cast Iron Lofts II, a new 27-story, 232-unit luxury residential building in this Hudson County City. Located at 300 Coles Street, the industrial-inspired building is the 2nd property to open within the Cast Iron Lofts collection which is spearheading the creation of SoHo West (South of Hoboken, West of New York City), a vibrant new neighborhood of oversized residences in highly-amenitized buildings on the border of Jersey City and Hoboken. Cast Iron Lofts II boasts expansive one-, two- and three-bedroom residences with a full suite of indoor and outdoor amenities and 20,000 square-feet of street-level retail space. The Grand Opening of Cast Iron Lofts II follows the successful lease up of the 155-unit Cast Iron Lofts I apartment building, giving credence to the appeal and market acceptance of this emerging neighborhood setting. Current retail providers include 8 Springs Studio, a Pilates and Yoga studio; Brewshot, a coffee shop that has several other locations in Jersey City and NYC; and Viaquenti Academy, a bilingual pre-school. Construction is well underway on the next two-tower building which will include 377 residences. When completed, the SoHo West development will comprise 1,360 residences in multiple buildings and street-level retail space. The ribbon cutting ceremony, which took place in the building’s fully-decorated lobby, occurred with Cast Iron Lofts II fast approaching 70% leased since the start of its rental program less than four months ago. Jersey City Mayor Steven Fulop (Left) and Manhattan Building Company COO Lou Mont (Right) discuss the emergence of the SoHo West neighborhood on the border of Jersey City and Hoboken on the 17,000 square foot landscape terrace of Cast Iron Lofts II. Homes at Cast Iron Lofts II range from 885 to 1,885 square feet of living space at monthly rents starting from $2,495. The apartments are complemented by distinctive architectural elements and features, including 10’ ceiling heights with exposed duct work, oversized windows, custom walk-in closets, hardwood floors, granite countertops, bathrooms with stained marble vanity, polished porcelain Carrera-tiled floor and glass enclosed showers with shower surround and massaging shower-heads. There’s also state-of-the-art, fully-equipped kitchens with stainless steel appliances. The full suite of amenities at Cast Iron Lofts II is highlighted by a resort-style 17,000 square-foot rooftop deck with a heated pool, pool-side shower, gas BBQ grills, outdoor fire pit lounge areas, and lush landscaping with a shaded tree grove and sitting area. There’s also a state-of-the-art fitness center, yoga studio and fitness on demand system, business center, private conference room, children’s playroom, resident lounge with bar, fireplace, billiard table, shuffleboard and large screen TV; a lobby library lounge and bike storage.